Patrick Ho Chi-ping JP (Chinese: 何志平; Sidney Lau: Ho4 Ji3 Ping4; pinyin: Hé Zhìpíng; born 24 July 1949 in Hong Kong) is a Hong Kong ophthalmologist turned politician. He joined the Chinese People's Political Consultative Conference and the Preparatory Committee of Hong Kong SAR. When the Principal Officials Accountability System was introduced in 2002, Chief Executive of Hong Kong Tung Chee-wah appointed Ho Secretary for Home Affairs, a senior ministerial post. He was convicted of bribery offences in a U.S. federal court in 2018. Ho studied in the Diocesan Boys' School, Hong Kong. He won a scholarship and was educated in USA for 16 years. He is an ophthalmologist who trained in eye surgery with special expertise in retinal surgery, he was a fellow at Harvard Medical School. He returned to Hong Kong in 1984 and taught eye surgery at the Chinese University of Hong Kong as Professor of Ophthalmology. From 1988 to 2000, he was Professor of Surgery (Ophthalmology) at the Chinese University of Hong Kong. Since 1993, he has been a member of the 8th, 9th, 10th and 11th National Committee of the Chinese People's Political Consultative Conference, and in 1995, he was appointed as a member of the Preparatory Committee of the Hong Kong Special Administrative Region and the Selection Committee of the first SAR Government. He was the vice-chairman of the Hong Kong Policy Research Institute. In July 1997, he was appointed to the Provisional Urban Council until its disestablishment in 1999. 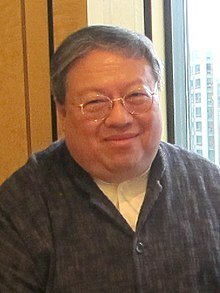 In 2000, Ho was appointed Chairman of the Arts Development Council. In 2002, he joined the Chief Executive of Hong Kong Tung Chee-wah's second HKSAR administration as the Secretary for Home Affairs when the Principal Officials Accountability System was introduced. He served in the senior ministerial post for five years. In 2003, he was present at the Che Kung Temple in Sha Tin following tradition and drew Kau Chim sticks to foretell the fortune of Hong Kong. He drew number 83 which represented bad times ahead. Coincidentally Hong Kong experienced a fatal SARS outbreak and an attempted legislation of Basic Law Article 23, which led to the massive protests at the 1 July march. Ever since, no Hong Kong minister has represented the government to the temple. Ho was appointed chairman of the Sports Council in 2005. After leaving the government in 2007, he joined a lobbying firm established and funded by CEFC China Energy (CEFC), a Shanghai-based energy company, of which he became vice-chairman and secretary-general. The organisation, under Ho, was a leading exponent of the Xi Jinping's Belt & Road Initiative. Ho and former Senegalese foreign minister Cheikh Gadio were arrested in New York in late November 2017, charged with violating the Foreign Corrupt Practices Act (FCPA) and money laundering. The pair offered a US$2 million bribe to the president of Chad for oil rights, and deposited a US$500,000 bribe to an account designated by the Minister of Foreign Affairs of Uganda on behalf of CEFC. The million-dollar bribes were dressed as donations. The energy fund, chaired by Ye Jianming, denied authorising Ho to engage in corrupt practices. On 5 December 2018, Ho was convicted on seven counts of bribery and money laundering, following a federal trial in which Gadio stood as a witness for prosecutors. He was sentenced to three years' imprisonment and fined $400,000 in March 2019. Ho married then Taiwanese actress Sibelle Hu Huizhong on 5 September 1997. They have one daughter, Audrey Ho Ka-chun. ^ "Tung delays naming new team". The Standard. 21 June 2002. ^ a b c Cheung, Gary (6 December 2018). "Musician, eye surgeon and a politician who married an actress, Patrick Ho led a varied, eventful life before bribery scandal". South China Morning Post. Retrieved 16 March 2019. ^ a b "'Civil diplomat' Patrick Ho tapped UN connections to broker deals". South China Morning Post. ^ Cheung, Gary. "Musician, eye surgeon and a politician who married an actress, Patrick Ho led a varied, eventful life before bribery scandal - Asean Plus | The Star Online". www.scmp.com. Retrieved 7 December 2018. ^ "Ho Takes Charge of Supreme Body". South China Morning Post. 14 January 2005. Retrieved 15 March 2019. ^ Zhuan, Ti (12 May 2017). "China's worldwide infrastructure investment promotes globalization 2.0". China Daily. Retrieved 16 March 2019. ^ "US arrests Patrick Ho over alleged oil bribes". South China Morning Post. ^ Cheng, Kris (21 November 2017). "Explainer: Patrick Ho's bribery allegations – from top Hong Kong official to US police custody". Hong Kong Free Press. Retrieved 23 November 2017. ^ "Ex-Hong Kong Official Convicted in Bribe Case Involving Chinese Oil Company". New York Times. 5 December 2018. ^ Lum, Alvin; Emma Kazryan (6 December 2018). "Former Hong Kong minister Patrick Ho Chi-ping convicted in US court on 7 of 8 counts in bribery and money-laundering case". South China Morning Post. Retrieved 7 December 2018. ^ Cheng, Kris; Grundy, Tom (26 March 2019). "3-years prison and US$400k fine for ex-Hong Kong official Patrick Ho, guilty of bribery". Hong Kong Free Press. Retrieved 26 March 2019. ^ "Taiwanese Actress Weds Hong Kong Surgeon". The Straits Times. 20 September 1997. p. 20.